establishing stronger, targeted enforcement mechanisms. NCIL worked extensively with ADAPT and others in crafting this legislation. We urge every member of Congress to cosponsor this important legislation protecting the Constitutional and civil rights of Americans with disabilities. 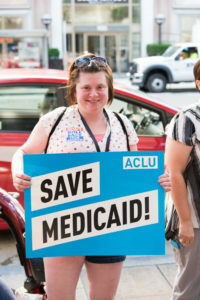 Reform Medicaid, Don’t Gut It! Reorganizing Medicaid services to eliminate wasteful bureaucracy: the current system wastefully organizes services based on diagnosis and age, even though people may have the same functional needs. By organizing services based on functional needs, states can eliminate redundant and needlessly expensive bureaucracies and reduce Medicaid expenditures. Such reform efforts require thoughtful planning. 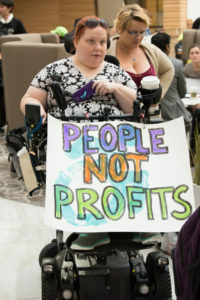 NCIL urges Congress to take the time to engage NCIL and the disability community to understand the needed reforms and craft legislation that can achieve our common goals. authorized accessibility standards for Diagnostic Medical Equipment so people with disabilities could get access to preventative healthcare screenings and appropriate diagnostic testing. NCIL urges Congress to maintain these important provisions of the ACA by addressing the problems with the existing law rather than repealing it. Money Follows the Person: The Money Follows the Person (MFP) demonstration program was designed to help states transition people with disabilities from institutions into the community and to assist states in rebalancing their long-term services and supports systems to increase access to home and community-based services. Since it began, 47 states have participated and over 75,000 disabled people have been liberated from institutions. On average, per-beneficiary per-month expenditures for those participating in the re-balancing demonstration declined by $1,840 (23%) during the first year of transition from a nursing home to home and community-based LTSS, saving $978 million. CMS also found that MFP participants are less likely to be readmitted to institutional care than other beneficiaries who transition but do not participate in the program. Unfortunately, MFP expired on September 30, 2016 and states have started to shut down their MFP programs. Congress must save and adequately fund MFP. It can do this by passing the EMPOWER Care Act – S. 2227 (Portman-R). NCIL supports access to DME and opposes efforts to cut funding or restrict access, as this is a hindrance to the independence and integration of disabled people and seniors. Complex Rehabilitation Technology (CRT): Medicare currently does not have unique coverage for the more complex needs of individuals with disabilities and chronic medical conditions that require medically necessary, individually configured products and services. We believe the creation of a separate recognition of CRT will result in decreased Medicare expenditures by averting hospitalizations due to conditions such as severe pressure sores and blood clots. In the interest of quality healthcare and optimal functionality for individuals with disabilities and chronic medical conditions, recognition of a separate category for CRT is needed, so NCIL supports the Ensuring Access to Quality Complex Rehabilitation Technology Act of 2017 – H.R. 750 (Sensenbrenner-R). Since 2015, advocates have been fighting CMS’ plans to use information obtained through the Durable Medical Equipment (DME) competitive bidding program (CBP) and inappropriately applying that to cut payments for accessories used on Complex Rehab manual wheelchairs. Congress passed several temporary delays, and in June of 2017 CMS issued a new policy to permanently resolve the issue for Complex Rehab power wheelchair accessories. But, the policy didn’t include manual wheelchair accessories, so further action is needed. Complex Rehab “accessories” are really critical components on wheelchairs, including pressure relieving cushions, positioning supports, tilt / recline systems, and specialty drive controls. CMS’ action violates the intent of Congress when it passed the Medicare Improvements for Patients and Providers Act (MIPPA) in 2008 requiring CMS to exempt Complex Rehab wheelchairs and accessories from the CBP. The negative impact would extend well beyond Medicare beneficiaries to also hurt people with disabilities in Medicaid and private insurance programs. NCIL supports the Protecting Beneficiary Access to Complex Rehab Technology Act of 2017 – S. 486 (Casey-D) and H.R. 3730 (Zeldin-R), which provide a permanent solution. discriminatory rush to judgment and denial of life sustaining treatment of newly injured persons based on hasty and unsupportable diagnosis of “persistent vegetative state” (PVS) earlier than 90 days for an anoxic brain injury, or one year for a traumatic brain injury, and before careful testing consistent with guidance from research studies on misdiagnosis of PVS. While we applaud the attention Congress and the Administration have given to opioid addiction across the country, we are alarmed that people with chronic pain and other disabilities have largely been left out of these conversations. This has resulted in millions of people with chronic pain facing increasing barriers to effective pain management, discrimination against people who use opioids to manage their pain, and treatment and recovery options that are inaccessible to people with disabilities. Many policy proposals have aimed to restrict access to opioid medications, but any true solution to opioid addiction will be unsuccessful unless people with chronic pain and other disabilities have a voice to ensure our needs are addressed as well. Community-based services are 21% – 29% less expensive than nursing homes, saving taxpayers $18,103 a year per participant. If assisted suicide is legal, some people’s lives will be ended without their consent, through mistakes, coercion and abuse. No safeguards have ever been enacted, or even proposed, that can prevent this outcome, which can never be undone. NCIL urges all members of the U.S. House of Representatives and Senate to cosponsor and support House Concurrent Resolution 80, expressing the sense of Congress that assisted suicide laws are dangerous and harmful to both people with disabilities and the general public at large. The key issues and concerns are summarized in the points and examples below. There’s a deadly mix between our broken, profit-driven health care system and legalizing assisted suicide, which will be the cheapest so-called treatment. Direct coercion is not even necessary. If insurers deny, or even merely delay, expensive live-saving treatment, the person will be steered toward assisted suicide. Will insurers do the right thing, or the cheap thing? Barbara Wagner and Randy Stroup, Oregonians with cancer, were both informed by the Oregon Health Plan that the Plan wouldn’t pay for their chemotherapy, but would pay for their assisted suicide. Though called a free choice, for these patients, assisted suicide would have been a phony form of freedom. Elder abuse, and abuse of people with disabilities, are a rising problem. Where assisted suicide is legal, an heir (someone who stands to inherit from the patient) or abusive caregiver may steer someone towards assisted suicide, witness the request, pick up the lethal dose, and even give the drug — no witnesses are required at the death, so who would know? Thomas Middleton was diagnosed with Lou Gehrig’s disease, moved into the home of Tami Sawyer in July 2008, and died by assisted suicide later that very month. Two days after Thomas Middleton died, Sawyer listed his property for sale and deposited $90,000 into her own account. After a federal investigation into real estate fraud, Sawyer was indicted for first-degree criminal mistreatment and aggravated theft. But the Oregon state agency responsible for the assisted suicide law took no action. Importantly, there is an alternative: anyone dying in discomfort that is not otherwise relievable, may legally today, receive palliative sedation, wherein the patient is sedated to the point where the discomfort is relieved while the dying process takes place. So, we already have a legal solution to any uncomfortable deaths that does not endanger others the way an assisted suicide law does. Diagnoses of terminal illness are often wrong, leading people to give up on treatment and lose good years of their lives, and endangering people with disabilities, people with chronic illness, and other people misdiagnosed as terminally ill.
Doctor-shopping: It’s become common knowledge in Oregon that if your doctor says no, call the main organization that supports assisted suicide—today it’s called Compassion & Choices but it used to be known as the Hemlock Society—and it will refer you to assisted-suicide-friendly doctors. They have been involved in between 75% and 90% of Oregon’s reported assisted suicides. Shopping for another doctor who says “yes” will get around the law’s weak safeguards. People with depression and other psychiatric disabilities are at significant risk. Michael Freeland, age 64, had a 43-year medical history of acute depression and suicide attempts. Yet when Freeland saw a doctor about arranging an assisted suicide, the physician said he didn’t think that a psychiatric consultation was “necessary.” How could this happen if the safeguards are as strong as alleged to be? But when Freeland chanced to find improved medical and suicide prevention services, he was able to reconcile with his estranged daughter and lived two years post-diagnosis, until he died a natural death. Financial and emotional pressures can also make people choose death. Family pressures are often hidden. Oversight & data collection are grossly insufficient. The reporting requirements lack teeth. There is no investigation of abuse, nor even a way to report it. The system does not report abuse because it’s set up not to find any abuse, and not to show abuse, even when it does exist. Wendy Melcher died in August 2005 after two Oregon nurses, Rebecca Cain and Diana Corson, gave her overdoses of morphine and phenobarbital. They claimed Melcher had requested an assisted suicide, but they administered the drugs without her doctor’s knowledge, in clear violation of Oregon’s law. No criminal charges were filed against the two nurses. There are a small number of penalties with no way to enforce them and no established means for finding out what happened. Most egregious of all, the State of Oregon has acknowledged that after each annual report is published, the underlying data is destroyed, so no outside party can conduct objective research. The Washington State assisted suicide law, and many current proposals in other states, require physicians signing the death certificate to list the underlying terminal illness as the cause of death, not the taking of lethal drugs, even if the patient was not experiencing any symptoms from the illness at the time. Many doctors see this as requiring them to falsify the death certificate, and it makes accurate data impossible to collect. People with disabilities endangered. Supporters of doctor-prescribed suicide always say this proposal won’t affect people with disabilities. But it will, whether or not they realize it. Terminal illnesses are almost always disabling in some way, particularly in the latter stages. And people with terminal illnesses are particularly vulnerable to risk. Oregon data also shows that the top five reasons people request assisted are disability-related concerns that assisted suicide laws do not effectively address, and that many people outlive their terminal diagnosis. Yet they still received lethal prescriptions.